Plzen & Schalke have both cost me quite a few quid until now. Decided to play Schalke and draw. Am still confident i'll make it this time. finished 1-1. Will be very tough for them in Gelsenkirchen, it's supposed to be a right old industrial cauldron. Still it's been a great story. In the time this thread has been running they've completely covered their Withdean style stadium, and got rid of the running track. I thought the adventure had finally ended. Down to ten men, and trailing 1-0 in this awesome stadium on 87 minutes, and suddenly - bang -the equaliser. Extra time looms. You really do not want to bet against this team. I bloody love them. Watching it on wiziwig. They're heroic. Lucky enough to be a guest of my buddy for tonight's Europa League game against Hapoel Tel Aviv. My first chance to sample the newly reconstructed stadium all covered now and without the athletics track. Apparently a capacity crowd of 12,000 kicks up a right old storm. Viktoria will be expected to win this one having seen them off in Israel a couple of weeks ago, but they will need to, as December brings the big one - Atletico Madrid. The best bit is he's got me a very acceptable price on a Marriott close to the ground so i am staying over for the pre and post match beers straight from the brewery source. Football heaven. Look out for our score. Viktoria cruised to a 4-0 victory, and I'm still a bit delicate from the post match celebrations. Hapoel were so useless that we pondered why Israeli teams are allowed into Europe in the first place. Viktorka, bless them, like to attack even when they have it wrapped up, so the second half was like an Astroturf first team vs reserves where the first team just ping it around and score a couple of goals when they feel like it. The atmosphere wasn't so captivating, but that's because the old stand, where we were sitting, towers above the new ones, so it's like looking down on the Valley from the apartments above. But the gang behind the goal had a lot of fun. Early second half they unfurled a long banner reading, in English "Better Dead than Red". My buddy and I were perplexed about which team they were having a go at. Because of the red star symbol at the end it appeared to be against Slavia, but as he said, they don't mind Slavia. Then we got it. It was an anti-Communist banner. The Communists are enjoying an electoral resurgence. The second foto is piss poor but the guy walking down is actually providing an at-seat sales service of beer. Anti-Communist protest, beer service, and a good hiding for the visitors. Really, what's not to like? Well I have tried to upload the fotos but failed. Can anybody walk me through it? Cheers. Why is this team sometimes called Viktorka? It's a typical affectionate diminutive of a name in the Czech language. The equivalent of Victoria- Vikki. 500 or so die hards made the two day trip by bus. Honestly, I was worried that Viktorka would suffer because of the winter break and the cauldron of Napoli. Wow, amazing result. Did Napoli field a full stregnth team ? Saw that score pop up thought napoli must've had a red bit no, fair play! Napoli rested a few people but they still had some big name players out there, so fair play to Plzen. Off to the game tonight, and one thing is certain, it will be probably the coldest weather I've experienced at a game, they promise it will be -8, and this is a late kick off. Another advantage to Viktoria, you can't imagine Napoli will fancy such weather. I just wonder how Viktorka will set up, being already 3 up against a team they nevertheless regard as technically superior. Could be a rather odd spectacle. Still, Viktoria rarely mess things up, I expect them to get through, and to witness prodigious celebration in the pubs afterwards. Well that was definitely the coldest I have ever been at a game. But if you look closely at the fans behind the gola down the front, a small group of them went barechested for heavens sake. Not the whole game mind. But what a great night. Viktorka the better team throughout, Napoli a huge disappointment, there is no fluke in this 5-0 aggregate win. And then the celebrations started. With the game finishing late I was worried there would not be much drinking time. Ha. When we left the pub at 01.10 it was still heaving. People singing, people getting the crestfallen Italians to sing, people falling off chairs, barstaff racing around trying to keep up with demand. This is great, the feeling that the whole town is celebrating and proud of its football club. Next up Fenerbahce. No reason at all why Viktorka wont despatch them the same way they've seen off the 3rd placed team in Serie A. Every chance of progressing further. Fenerbahce needed a penalty to beat 10 man BATE. Can see Plzen having far too much attacking threat for the Turks. Surprised some bigger clubs across Europe haven't picked up any of their players over the winter break. Good point. Their finances are in good order though, they are not under huge pressure to sell. They actually added to their squad in the window. Just watched the highlights of their game v Fenerbahce - was this game played behind closed doors ? Finished 1-1, Fenerbahce win 2-1 on agg. Crowned champions again yesterday. Sparta pushed them all the way, they finished two points behind. Pavel Vrba the coach will now be hot property, especially for Bundesliga clubs. He's being widely praised for bringing the joy back to Czech football thanks to their attacking philosophy. Epic scenes in the city last night apparently, (mainly in the pubs as the weather is foul). The ice hockey team are also the champions so its a famous double. And I have some Champions League nights to look forward to in the autumn. Plzen is actually a different Czech city (spelt Pilsen by the English and Germans). It is the proud home of the Pilsner Urquell brewery, which handily overlooks Viktoria's ground and supplies all the pubs. In unpasteurized form, as it is in those pubs, it is IMHO the best lager beer in the world by a country mile, and few foreigners who have tasted it disagree. It is not far from Prague, only 60 miles west, in the direction of Nuremberg, but very much its own city. It is the club which developed both Petr Cech and Pavel Nedved. So Prague is not where it's at this weekend. A significant % of Praguers are well pissed off (well, we are all pissed off with the weather, and the flood barriers have gone up). But shed no tears for Sparta. Always a horrible club. But shed no tears for Sparta. Always a horrible club. 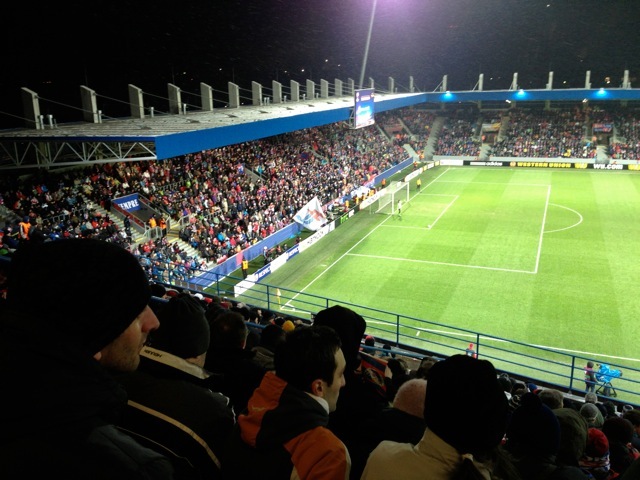 The Millwall of the Czech Republic ? Thanks for putting me right, PragueAddick. I wonder if you know the Czech and Slovak Club here in London, a converted Victorian house in West End Lane, Hampstead. These days it's billed as a bar and restaurant, but when I visited a good few years ago it comprised a basic bar with potent Pilsner Urquell on draught, and a separate old-fashioned room with long tables and carved seats, and hung with oils of Czech notables in gilt frames. Well worth a visit for its good beer and time-warped atmosphere. No, because Sparta have actually won some important silverware. Difficult to label in British terms, because some of their unpleasantness stems from their past history as the club of the Communist elite, (whereas Slavia was more for the educated dissident class). Nowadays they are perhaps like a wannabe Chelsea, the difference being they haven't really got much money.